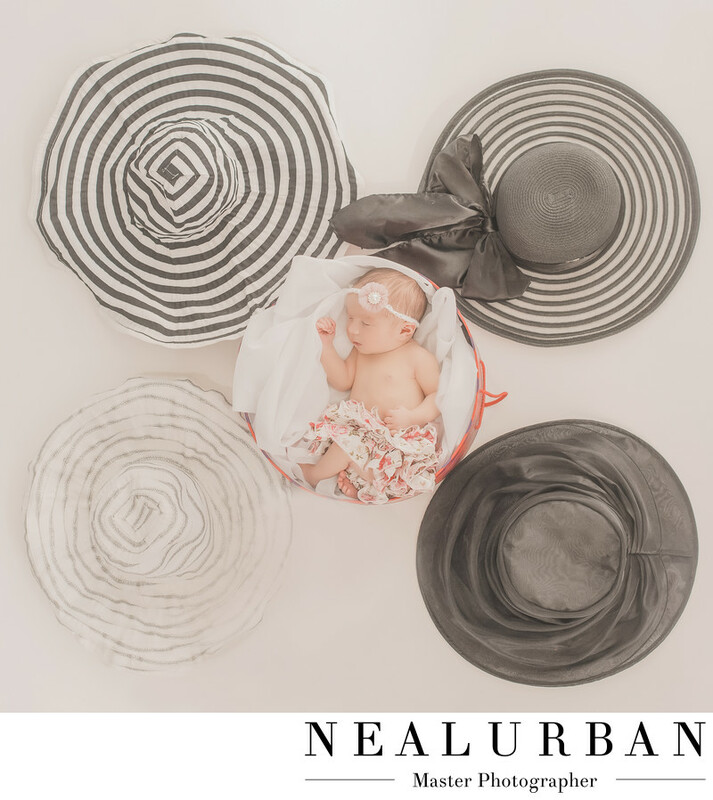 This was such a fun newborn session at Neal Urban Studio. We had already done so many photo shoots for mom and dad (Katie and Chad)! We did their engagement, wedding, their first child's newborn, which was a boy, his first birthday cake smash, and now the newest addition. A baby girl! Over the years we have learned that Katie and Chad love to go to carnivals and they seem to pick some winners for all of the big horse races, like the Kentucky Derby, Preakness Stakes, Belmont Stakes, and Traverse Stakes. One year they attended the Kentucky Derby and Katie had such a cute hat on. Nothing pairs better with the Derby than giant hats and mint juleps! We had the idea to base the shoot on hats. They loved the idea. I mentioned I had a bunch of hats I was going to bring in. She just had to bring the one she wore to the Derby. It just so happened all of the hats were a black, white, and gray theme. We would not need to change anything to match in post production. At the studio, we also had an old hat box! We decided to put the baby in the hat box and surround her with hats! We set this up so Neal could stand on a ladder and shoot overhead. Sometimes those are the best ways to get creative with newborn sets! We always love to come up with ideas for newborn sessions that can incorporate something the parents love. Katie and Chad are both teachers, so for their sons newborn, we created a mini classroom. Chalkboard, crayons, books, and even a globe were in the scene. We love to create sets!